Rancho La Quinta is a private gated community built in 1994 and located on 700 acres, at Washington, South of Highway 111 on La Quinta, California. Residents enjoy outstanding views of three magnificent mountain ranges, amenities and active lifestyle to match and exceed most country clubs in Coachella Valley. 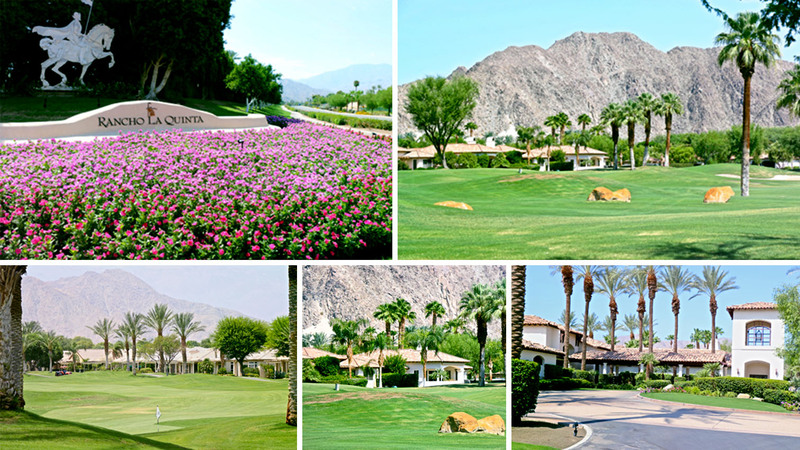 Enjoy the Rancho La Quinta lifestyle including golf, tennis, pools & fitness. Residents can socialize with organized events and on-site dining at the clubhouse. This beautiful country club is comprised of close to 960 homes with many sizes and prices. The excellent location of this community offers residents access to the desert area amenities outside the club. Rancho La Quinta Developer T. D. Desert Development began construction in 1994 and completed the 960-home community by 2009. Fairway Homes, Casita Homes, most enjoying fabulous views of the golf course, surrounding mountains, and landscape. Ventana Homes, were built on privacy lots. There is a wide variety of homes varying in size and price, Condos and homes ranging from about 1,725 to over 4,600 square feet of living space and feature two to six bedrooms, two to five bathrooms and two to two-and-a-half car garages. The clubhouse is the focal point of Rancho LQCC amenities. Here, residents can enjoy a total of 23,000 square-feet of Clubhouse facilities include the main dining room, a club room/bar, a private dining room, fully appointed Golf Shop, men’s and women’s locker rooms and “The Turn” for a casual bite before or after a round of golf. Life at Rancho La Quinta at this special community includes a very active club with men’s, women’s and couples’ events throughout the season. Rancho LQCC features Robert Trent Jones Jr. and a second, more modern layout by former U.S. Open Champion Jerry Pate. Rancho La Quinta Country Club is a former host of the PGA Tour’s popular Skins Game. Rancho LQCC Residents can also take advantage of the 9 lighted tennis courts. Choose from resort-style pools community pools and spas throughout the community. The Racquet Club also features a Tennis Shop, men’s and women’s locker rooms, a fitness center with state-of-the-art exercise equipment and The Cantina for breakfast or lunch.